A group of students on one powderpuff team attempt to catch a pass Friday. 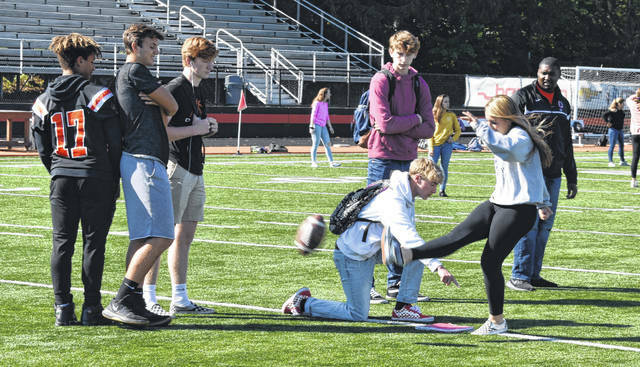 Coaches and players from the Hayes football team were on hand Friday to give tips to the powderpuff teams and to teach them plays and strategies. Freshman Alex Ritter attempts a field goal Friday morning during powderpuff practice. Ritter said teams from different houses have been practicing since Tuesday for the game on Oct. 3. Since last Tuesday, Hayes High School has had eight extra football teams. Eight powderpuff teams have been on the field practicing during their house period every day since Sept. 25 to get ready for the big game at 6 p.m. Wednesday, Oct. 3. The powderpuff game is just of many games and events that the eight houses at Hayes will compete in during the school year. Varsity football players and coaches have been coaching the teams, teaching the basics of the game such as defense, offense and kicking, as well as specific plays and defenses. Freshmen student and would-be-kicker Alex Ritter said she’s enjoyed the practices and is looking forward to the game. Sophomore Jordan Johnson said she joined the powderpuff team for several reasons. Leslie Dunster, Johnson’s teammate, agreed and said it’s nice to break from the normal schedule of high school. “It’s fun to get to go outside and do stuff,” Dunster, a sophomore said. Likewise, senior Syndey Breese said she’s enjoyed getting outside during the day and practicing. “It’s nice to get outside and not be in class,” Breese said. Breese added she also joined because it was her senior year and she thought it be a fun thing to do. 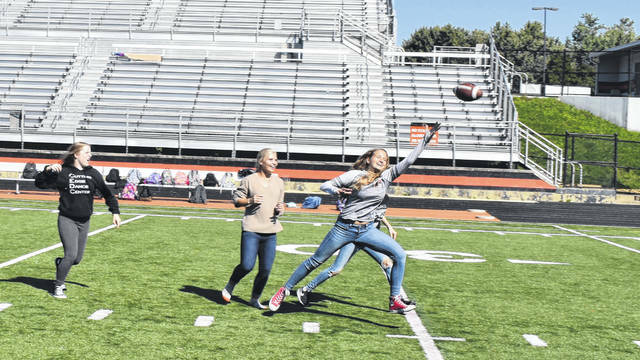 Breese and her teammate, Rachel Bordan, are also soccer players and said they were “recruited” to be on the team because they have plenty of kicking experience, but they said football and soccer have different kicking styles. One of the coaches for Steamtown, Keith Butts, is a few months into his first year teaching at Hayes and coaching the football team. Butts said he enjoys coaching the powderpuff teams. “It’s great seeing the school come together to have fun,” he said. Butts said the girls had picked the game up quickly. Butts added he’s had to remind himself that he’s not coaching the varsity team. The game is at 6 p.m. Wednesday at Cornell Stadium.